The Rainbow Six: Siege trailer at E3 2015 demands that you get your strategy-loving, Tom Clancy-worshiping team back together a month sooner than the release date. It turns out that Ubisoft is launching a Rainbow Six: Siege beta on September 24, just ahead of the game's official October 13 release date. Coming to the Xbox One, PS4 and PC, the first-person tactical shooter naturally looks better than its last generation predecessors. It's partly thanks to its new Anvil game engine. As you can see in the new Rainbow Six: Siege trailer from E3, the story features actress Angela Bassett as Six, the deputy director of the counter-terrorism unit. What really has us interested in Rainbow Six: Siege is the return of the Terrorist Hunt game type. This is in addition to normal PvP gameplay. 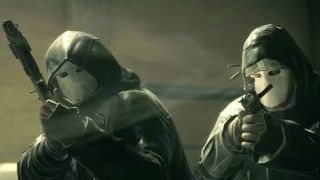 Terrorist Hunt places players at the center of a global crisis perpetrated by a menacing terrorist cell, the White Masks, according to Ubisoft. It's is broken down into four different game modes fit for solo or cooperatively play with up to four additional teammates. How can you demo all of this and more if you're not at E3 2015 to play Rainbow Six: Siege? Ubisoft says you can sign up on its website for a chance at the beta or pre-order the game for guaranteed access.